Le Môle, center, seen from Geneva on a hazy June day. Le Môle is a mountain of the Chablais Alps in the Haute-Savoie department of France which dominates the area around the town of Bonneville. The communes of Ayze, La Tour, Saint-Jean-de-Tholome, Marignier, Saint-Jeoire-en-Faucigny, Viuz-en-Sallaz, Peillonnex, and Faucigny encircle it. It rises to 1,863 metres and affords an excellent 360-degree view of the surrounding region. 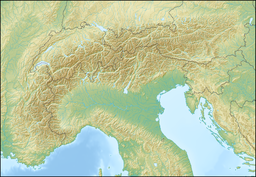 Though a small mountain by Alpine standards, it is of great geographic importance as it divides the vallée de l'Arve to the south and the west from the vallée du Giffre to the north and southeast, and dominates the southern entrance to the Geneva basin. Mary Shelley, in her Frankenstein, or the Modern Prometheus, quotes Le Môle as being seen by Victor Frankenstein from Geneva, where he was born and lived before being a student in Germany. Le Môle (to the left of Mont Blanc, in the background) as seen from Geneva, to the right and in the foreground is the Salève. ^ "Le Môle -peakbagger". peakbagger.com. Retrieved 5 February 2015. This page was last edited on 19 April 2017, at 04:57 (UTC).